Panasonic has been quite active in the domain of compact system cameras and has so far introduced some pretty impressive devices. Among the latest cameras, Panasonic Lumix DMC-GF3 has consistently been receiving high praise and appreciation from the critics. To start with, the light weight physical structure of this compact system camera is something that many point-and-shoot graduates would feel very comfortable with. Sony has previously released compact system cameras with small bodies but unfortunately, the E-mount zoom lenses for those cameras are too big and heavy. Just like its predecessor, the GF3 also uses the 12-megapixel Live MOS sensor and Venus Engine FHD processor. There are, however, certain improvements in this model such as Light Speed autofocus system and focusing options like pinpoint and a picture-in-picture navigator for manual focus. All these factors contribute towards excellent photo quality with this device. The G-series from Panasonic have been doing extremely well in the market and the noise profile and JPEG processing in almost all of them is very impressive. The post processing on GF3, however, makes the out-of-focus areas a bit mushy instead of giving them a touch of natural blur. The overall color contrast and tone production seems to be quite fine as well. Talking about the video quality of this compact system camera, it might be just fine for personal consumer clips. But there is a lack of mono sound while the external mic support is also missing which makes it inappropriate for video experimentation. So basically this camera is not for you if you are more into video experimentation and film making. The 14mm F2.5 Panasonic pancake kit lens also comes with this camera. This lens might not be the best one around for micro four thirds, but for starters it is a lightweight and affordable option capable of providing good results. Besides, Panasonic has also said that the company would release the 14-42mm X lens in August with the GF3 which would be a lot better. Also the orice of the Panasonic Lumix DMC-GF3 with the 14mm pancake lens is quite competitive. 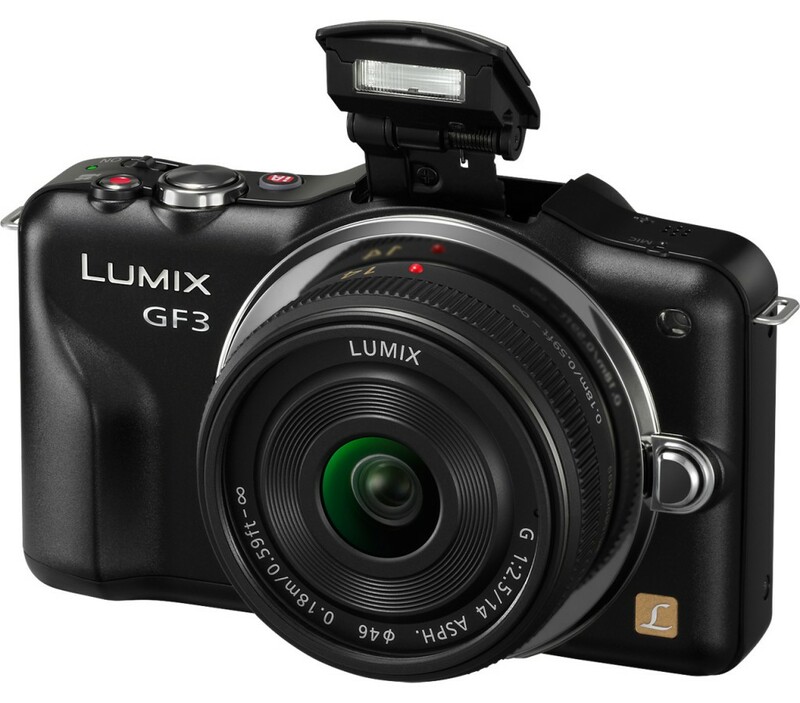 It can be purchased for $379 USD in Amazon since the pancake lens alone costs $260 USD at Amazon too making the GF3 micro four thirds compact system camera cost a mere $119 USD taking the price differences into equation. There are certain aspects in which GF3 is considerably better than the earlier models from the G series. For example, for nonburst shooting it’s quite faster compared to its predecessor G3 which was larger in size and more expensive. It is also faster than almost all the non-DSLR cameras that have been released over the last couple of years and happens to be almost equal to Sony Alpha SLT-A35. And when it comes to burst mode, this camera seems to be perform even better than low end DSLR cameras from Canon and Nikon such as Canon EOS Rebel T3 and Nikon D3100. The time between powering on and shooting is just about 0.6 second which, although not extraordinary, is better than most other devices out there. Besides, it takes 0.3 second to focus and shoot, with the time increased to about 0.6 second in lower-contrast light. Overall, photography buffs would find excellent photo quality with this remarkable camera which can be considered the very best in the G-series cameras from Panasonic. Particularly if you intend to move from point-and-shoot photography to a bit advanced level, this is is the perfect compact system camera for you.